Is it me? Or have the internal bezels ruined that Classic look? and for me at least the jury is out as to whether this is an improvement or not. This is the latest one and you can spot the difference immediately. The outer slide-rule bezel has disappeared to materialize inside the watch and adjusted by the use of a turn screw crown on the outside of the case. The case is black colored Titanium, which I do like, but the rest of the dial set up is more or less the same as it’s always been – and for that I am truly happy – why change a design classic? The functions are more or less the same I understand, Chronograph, Radio Control, Eco-Drive etc etc. The lighting is as was, so is about as good as it gets and that appears to be it. Slide rule inside not outside. So it looks slightly different and funnily enough I’m the kind of guy that’s never been overly fond of multi-data bezels, so I should like it. 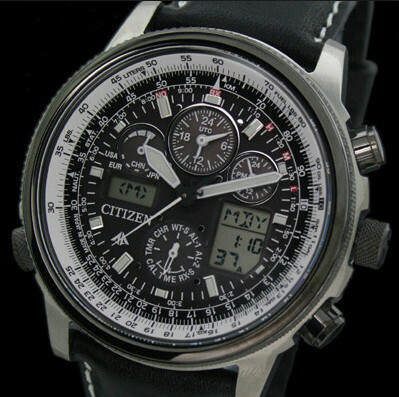 Skyhawk JY0005-50E – Looks sleek and Classic! 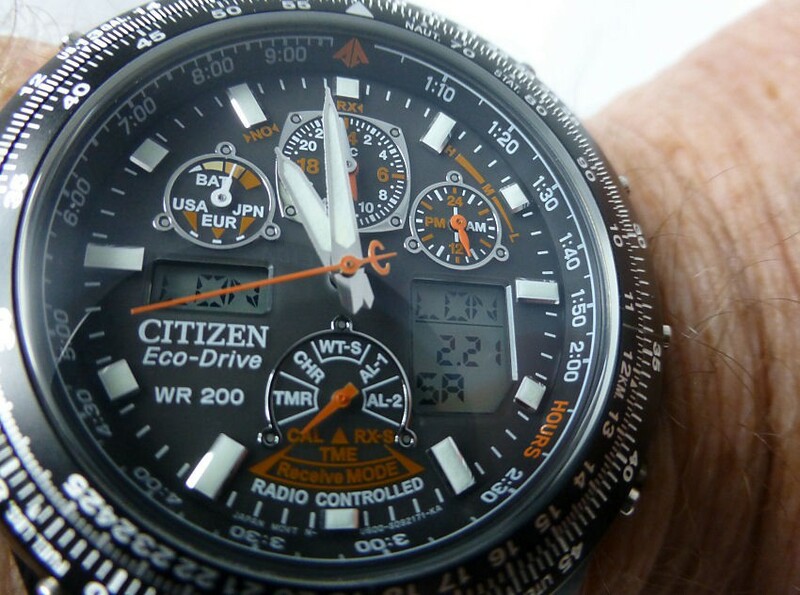 But NOT SO – as in the case of the older Citizen Navitimer and Sky Hawk models – these bezels have always just been SO good and so much part of the design concept – I love them. So unfortunately the outside to inside bezel change just doesn’t do it for me – and is it me or has the new version suddenly become a little lumpier exterior wise? And not nearly as sleek with that extra (and large) crown on the left side and the existing ones looking larger and more aggressive? Conclusion – Can’t see any reason for this so called upgrade, as my older model is still available and at a much cheaper price and looks better in my opinion.